Weight adjustable! Add or remove weight without taking them off. These ankle weights have external pockets, so you can adjust the weight to suit your needs. Adjustable Velcro closures ensure a secure fit. One size fits most. Removable weights included. Deep Purple. Product Part No. Item No. 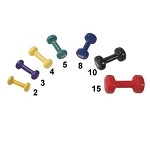 Exercise Equipment - Power Systems Deluxe Vinyl Dumbbell 8 lb.